Thanks to Rifftides reader Greg Curtis for flagging a performance by Les Paul of Harold Arlen’s best known song. This was at Fat Tuesday’s in New York, most likely in the 1990s. Paul’s accompanists were rhythm guitarist Lou Pollo and bassist Gary Mazzaroppi. Later, Paul moved to the Iridium on Times Square for the Monday night gigs that in his late eighties brought renewed fame to the man whose innovations included perfecting the solid body electric guitar in the early 1940s. 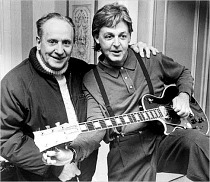 One result of that piece of inventiveness is that he often gets credit or blame for the success of rock and roll (he is pictured here with Paul McCartney). Les Paul further revolutionized the music industry by introducing multi-track recording. He is in the National Inventors Hall of Fame and the Rock and Roll Hall of Fame, most likely the only member of either to have played with Jazz At The Philharmonic. In 2009 a few weeks after his final Iridium appearance, he died at the age of 94. Les apparently never lost his interest in the technical side of music production. On a couple of occasions during his later decades, we passed in the aisles as we were both cruising the equipment exhibits at annual conventions of the Audio Engineering Society that were held in New York. I didn’t attend the musical instrument shows, but I suspect he was equally active there.